Bamber Bridge boss Mick Taylor has urged his team not to rest on their laurels this evening when they face derby rivals Lancaster City. The Dolly Blues – who drew 1-1 away at Whitby Town on Saturday – will go above Brig in the table if they collect three points tonight. There will also be extra spice to the match as City’s line-up is likely to feature Brad Carsley and Paul Dawson. They left Brig last month to move to the Giant Axe. City have also swooped for ex-Bolton winger Ryan White, who featured for Brig earlier this season before moving to FC United. Lancaster are also in a decent form, winning two and drawing four of their previous six games. 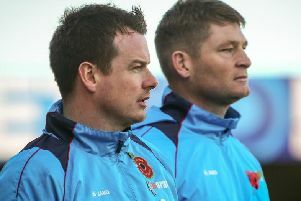 “We are looking forward to the Lancaster game,” said Taylor. “It’s going to be a tough game. On the transfer front, Taylor has bolstered his squad with the acquisitions of Ben Thomas, Daniel Wisdom James McCarten and Mark Buchan. McCarten and Buchan featured in the Brig squad on Saturday – the former going straight into the starting XI against the Mariners, slotting alongside Matt Lawlor in the centre of defence. He has arrived from Warrington Town and is a tall, dominant centre-half. 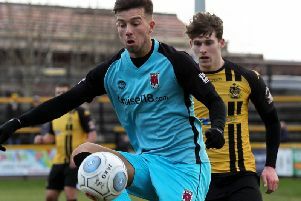 Buchan – who has enjoyed a spell at Irongate in the past – has joined from Kendal. Taylor’s other two signings require a few training sessions before they will be considered for first-team training. Thomas is a 22-year-old full back who arrives from Kendal Town, having previously served his time at Morecambe FC’s academy. The signing of Wisdom, 29, was described as “a great coup” by Taylor as he brings a wealth of non-league experience having previously played for Kendal, Northwich Victoria, FC United of Manchester and Stalybridge Celtic. Meanwhile, in the FA Trophy, AFC Fylde travel to Ramsbottom in a fourth-round replay this evening. The original tie at Mill Farm was remarkable – it finished 5-5. In the NPL West Division, Clitheroe travel to Skelmersdale United.